The Minister of Tertiary and Higher Education, Prof. Aiah Gbakima, has told Members of the Parliamentary Committee on Education that the Milton Margai College of Education and Technology (MMCET) should remain as a polytechnic institution. Prof. Gbakima said there was no reason as to why they should transform MMCET to a university as the country haven’t what it takes to train middle level manpower. “Let the Polytechnic stays as it is rather than transforming it into a university. The polytechnic is mainly there to train middle level people and there is no one to do its job, if we transform it into a university. It will cause a lot of problem for us as a country, if the polytechnic be transformed. Other countries have tried it and they regretted why they had to change to universities. We do not want to take technical to university. A diploma is not a requirement to go to a university unless you have a complete WASSCE requirement,” he said. Prof. Gbakima,who was last week hosted in Parliament stated that the country needed practical education and not oral aspect. 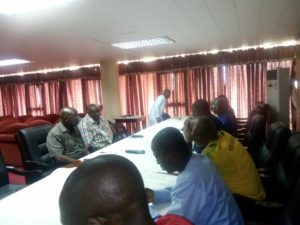 “The importation of rice or onions will not be necessary if the practical aspect is cut off and the polytech is playing a major role in that aspect. There is a difference between a polytechnic and a university, hence it cannot be transformed into a university as the country will have to build new polytechnics and there is no fund for that purpose,” he said. But Chairman of the Committee, Hon. Alimamy O. Kamara, stated that the country was constrained with the issue of transforming MMCET to a university, as it was very necessary. He said the issue should be well managed and a resolution be made to cabinet for onward discussions. He appealed to the minister to rethink and see reasons for the transformation to take place. “When the Chief Minister made the statement about the transformation of the College on that day, there was a standing ovation for such pronouncement. I am appealing to you Mr. Minister to sleep over it and see where it lands. We should also consider whether to build a new university or to transform the ones we have already. The cost should be considered critically,” he admonished. Member of the committee, Hon. Rolan F. Kargbo, said there was need to go into dialogue on the issue as it was very important. “If we want to have quality then the issue of cost should not be considered. We have to involve money. Starting a polytechnic is very expensive. We need to think very seriously, if we are not ready to face the cost,” he said.